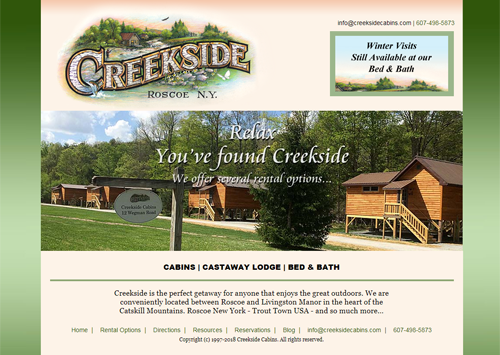 Creekside Cabins is an awesome getaway for anyone that enjoys the great outdoors near Roscoe and Livingston Manor in the heart of the Catskill Mountains. Zelacom has been working with them for nearly 20 years; their current website was designed in 2015. Over the years we’ve contributed original photography, including panoramas, and video editing. The beautiful logo was created by artist Roger Baker.